Public memory emerges from the intersection of official and vernacular cultural expressions, says John Bodnar, in a book on how commemoration practices work in the context of 20th century political and national identities (Bodnar, 1993, p.14). Public memory is produced from a political discussion that involves not so much specific economic or moral problems, but rather fundamental issues about the entire existence of a society: the structures of power, as well as the meaning of past and present. It is rooted in the inherent contradictions of a social system and it involves both local and national structures, both political leaders and their followers. It may take the form of an ideological system with special languages, symbols, narratives of its own, which individuals or communities may use as a cognitive device to select a set of explanations from a wide range of competing, even conflicting interpretations. The main mission of this cognitive and communicative process is not the past, but present issues, which have to do with structures of power, with a group’s loyalty to the discourses and symbols of official and vernacular cultures. Public memory, the structures of power and culture (cultures) are always intertwined, as cultural understanding is grounded in the material structure of the society. Memory makes the cultural exchange more vivid, more authentic, while leaders may use memory to validate official interests, or ideologies. John Bodnar also notes that the orchestration of commemorative events may serve various purposes: to calm anxiety about change or political events, eliminate citizen indifference towards official concerns, promote exemplary patterns of citizen behaviour, stress citizen duties over rights. Ordinary individuals may react to such actions of the leaders in various ways, accepting official interpretations of reality or expressing alternative renditions of reality (p. 16). A recent example of how public memory has been put to use in Romanian official discourse has been a peculiar aspect of the second round of the presidential election campaign in December 2009. Because of the lack of practice in democratic elections in Romanian politics during the years of communist dictatorship, in the two decades after 1989 the discourse of Romanian election campaigns, as well as the public’s perception of the elections, have been heated and over-dramatic. In 2009, a year of economic depression and political instability, this spirit has been more intense than ever. After a first round, in which the candidate of the Liberal Party, Crin Antonescu has scored only 22%, the second round witnessed a competition between the candidate of the Democrat-Liberal Party, Traian Băsescu, and the candidate of the Social-Democrat Party, Mircea Geoană. For the first time in Romania’s recent political history, often characterized by a dissipation of power because of the big number of political parties engaged in competition, the Liberal candidate announced his support of the Social-Democrat candidate in the second round, against Traian Băsescu. Moreover, at the initiative of Timişoara’s mayor, a declared supporter of the Liberal candidate in the first round, a partnership between Crin Antonescu and Mircea Geoană was signed in Timişoara on 1 December, Romania’s National Day. Both patriotic and less patriotic spirits expressed their dissatisfaction and revolt against this abuse of patriotic symbols. The election campaign for the second round continued in the first week of December, when Romania, but especially Timişoara, was preparing for the commemoration of 20 years after the anti-communist Revolution, which began in this city on 16 December 1989. connecting the two events, Mircea Geoană’s campaign staff produced a series of banners, which were placed strategically in key locations of Timişoara, which, for the local population, are genuine lieux de memoire: Calea Girocului, renamed, after the events of 1989, the Martyrs’ Street (some of the first clashes between the demonstrators and the army took place here, and the first victims fell), Cluj Street (a strategic location, the seat of the local radio broadcast company, which was assaulted by the so-called terrorists and defended by the army after Timişoara declared itself the first free city in Romania and the radio company resumed its activity) (see Appendix, note A), Calea Lipovei (where the Revolution Martyrs’ Graveyard is found) etc. The banner is very evocative and addresses the citizens of Timişoara exclusively, because it appeals to their memory of the 1989 events, their pride of being the first to have done away with the communist regime (see Appendix, note B), their civic duty, the intensity of their political involvement in issues of national importance etc. The banner presents a black and white picture of the Opera Square in Timişoara (renamed Victory Square after the events of 1989), a picture which circulated all over Romania and even all over the world as a symbol of the country’s courage, unity and power to do away with the totalitarian regime in the most violent of the anti-communist revolutions of Eastern Europe. The picture was taken on 20 December 1989, the day when Timişoara declared itself the first free city of Romania, when all factories and public institutions went on strike, when the army joined the demonstrators, before th“terrorists” started to destabilize the precarious equilibrium obtained after Dictator Ceauşescu fled Bucharest - in short, the photograph depicts a moment of ultimate solidarity, joy and hope, when political time was suspended. The picture itself was very familiar in the urban and mental landscape of Timişoara and was also inscribed in a certain horizon of expectations, since the city was preparing for the celebration of two decades of democracy, the commemoration of the bloodshed of December 1989, and for a period of official mourning. The caption of the picture brought the viewers back in 2009, in the pragmatic context of the election campaign, with big fonts in carefully chosen colours (the chromatic symbolism of the two parties who had joined forces against their rival) and with key words that secured a passage from past (1989, the ideals of the Romanian Revolution) to present (2009, the competition between two persons rather than the clash between two distinctive political doctrines). In red (associated chromatically with Mircea Geoană’s party, but also, more neutrally, with the colour of the communist dictatorship and of the bloodshed of December 1989), one can read about the period elapsed since these events: 1989-2009. 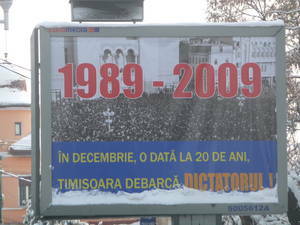 The caption is in blue and yellow (the Liberal Party’s traditional colours) and reads: “In December, every 20 years, Timişoara removes the dictator” (dictator is written in orange, the colour of the Democrat-Liberal candidate and the verb is, literally, “throws off board”, reminding of Traian Băsescu’s initial profession, that of a sailor). The upper half of the picture may be one of the numerous (neutral) visual mementos of the Romanian Revolution, which circulated all around Timişoara during the days preceding the series of commemorative events. The caption makes this banner probably one of the strongest statements uttered in the presidential election campaign of November-December 1989. Quite surprisingly, though, the banner caused almost no public reaction, unlike the partnership signed between Antonescu and Geoană on Romania’s National Day. The latter event engendered public demonstrations in Timişoara and in Bucharest, violent reactions from politicians, criticism in the media. The former passed unnoticed, probably for two reasons: firstly, because it had only a local distribution (addressing only the target public who had a strong sense of complicity with the events depicted in the picture, as witnesses, as subjects who lived the intense experience of the Revolution in Timişoara) and secondly, because the subversiveness of the lower half of the picture may have passed unnoticed due to the evocative power of the upper half. To me, this complete lack of reaction, given the high degree of criticism attached to the partnership signed on December 1, was surprising. The fact that the misuse of the symbolism of the National Day (chosen in the period following the events of December 1989, when Romania was reinventing itself as a modern, democratic, independent state, with a new name, a new flag, a new National Day, a new constitution etc) was regarded, even by the inhabitants of Timişoara, more iconoclastic than the way the memory of the Revolution was put to use is, I think, significant of how allegiances have been suspended during the election campaign. I confess I was greatly distressed by this banner because I saw it on Cluj Street - the street where I lived during the events of 1989, near the building of the radio company. As a 13-year-old girl, I witnessed the battle for the radio station, I learnt to live, for almost a month, with a tank parked in front of my house, I helped my grandmother cook for the soldiers who were defending the radio station, I saw the workers on strike from the industrial platform marching towards the Opera Square - where the picture was taken - and I ducked when three bullets hit the façade of my house. I was intrigued by the prompt reaction of the witnesses of the revolution, the families of the revolution casualties after the signing of the partnership was announced (many groups of people gathered in the Opera-Victory Square protesting against the abuse and sacrilege) and puzzled by their indifference at the sight of the Liberal-Social-Democrat banner. Note A: The picture of the banner was taken on Cluj Street, on 12 December 2009. Note B: A local saying goes â€žBanat is the top”, betraying this community’s self-image. BODNAR, John, 1993, Remaking America: Public Memory, Commemoration, and Patriotism in the 20th Century, Princeton, Princeton University Press. Publié sur le site de l'Atelier international des usages publics du passé le 13 octobre 2010.